A council has agreed to give £250,000 towards a fire-hit school to help provide community facilities. 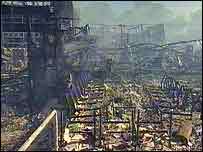 Rugby Borough Council is to give the money towards Avon Valley School which was destroyed by fire in June 2004. It has reopened with temporary classrooms. Warwickshire County Council and the Department for Education and Skills are meeting the bulk of the £17.7m costs. The school is expected to open in September 2007 and will be equipped with fire sprinklers. Rugby Borough Council leader Craig Humphrey said: "This is an ideal opportunity to provide facilities for the wider community that would not necessarily have been built under the original scheme. "The council is interested in focusing on an extension to the Positive Futures scheme, which works on a one-to-one basis with teenagers in the area. "We hope that this contribution will help secure the scheme's long term future in what is a socially-deprived area of the town." The school specialises in the performing arts and the design includes an indoor and outdoor theatre space. Warwickshire County Council leader Alan Farnell said: "The rebuilding costs are higher than the insurance settlement following the fire but everyone in Rugby is determined to ensure that there are first class facilities for Avon Valley."